Shri Nangli Sahib Darbar Trust Nangli Tirath Nangli Dham: Shri Shri 1008 Shri Swami Swarupanand Ji Maharaj Paramhans "Shri Guru Maharaj Ji"
Shri Shri 1008 Shri Swami Swarupanand Ji Maharaj Paramhans "Shri Guru Maharaj Ji"
Krishna was born in Dwapar under very tormenting circumstances, in a jail in Mathura ruled by tyrannical Kansa. Jesus Christ was also born under similarly oppressive circumstances in Bethlehem and his parents had to run away to Mishra from the terror of king Harodas. History has been full of similar incidents when great men have taken birth to establish the precedence of dharma in troubled times. In 1884, India was ruled by Britishers.The bordering areas in western part of India was extremely violent place as Kabaili pathans known for their cruelty, fierceness and criminal antecedents, outnumbered Hindus. These pathans were also religiously fantastic and used to torment people from other sects. Though there a couple of Sufi saints in that area at that time by these pathans were unable to be convinced by these Sufi saints. In such violent area and under extremely opposite circumstances, Shrimati Radha Devi, wife of Lala Prabhudayal, gave birth to a son in February on the festive day of Basant Panchami. The son was named as Beliram. Lala Prabhudayal was resident of Teri(now in Pakistan) under Kohat district. Since childhood only, Beliram had started giving indications for people to belive that he was someone extraordinary with divine power. During pregnancy his mother used to over hear Bansuri tunes. Radharani was a very religious women given to satsangs and used to donate. Once she had gone to a temple and kept her three months old son lying outside the premises of temple along with some other smaller kids. After coming out from he temple the small kid Beliram was not to be found, though all other kids were there. Everyone started searching frantically during the day and night in nearby areas but they couldn’t locate him. Next day, one of Lala Phabhudayal’s associates Muhammad Noor Alam informed that there is a kid lying in nearby jungle and is surrounded by snakes. After reaching there he was identified as Beliram and everyone became so relived and happy. Once Lala Prabhudayal took Beliram and few of his friends to fair. Everyone was roaming around the Mela while Beliram was found have moved to nearby jungle and doing meditation. For many days he used to get up early in the morning and get up people to send them to temples and Gurudwaras and himself used to imitate Sadhu’s. He never went to school but was very fond of reading religious books to others. He was very frequently found meditating in the jungles of Teri. At the age of thirteen he lost his parents. His elder brother tried to initiate him in day to day activities but was simply not inclined to it. Gradually Beliram reached to the age of seventeen. At the same time Shri Paramhans Dayal Ji visited Teri after accepting the invitation of Bhagwandas Ji. The quality of his satsang started getting discussed everywhere. Many men and women used to visit Dayalji and enjoyed his satsang. However Beliram was not keen to visit his satsang. On being asked he said — “Now my mind is impure. I will visit him once it gets purified”. After some days when Beliram visited Paramhans Dayal Ji he said — “Its good that you came or else I had to go there to get you”. Shri Beliram Ji felt extremely happy after meeting Paramhans Dayal Ji and got dikshit from him and started practising Bhajan. Very soon he became famous as most favourite disciple of Paramhans Dayal Ji. Now his spiritual awakening had started and even his family members had accepted his inclination towards Guru. As per instructions from his Guru, he used to meditate into a cave beside river Toi in Teri and used to go to the nearby villages once in a day in afternoon for seeking alms. He used to say Harihar only once at someone’s door and if there was no response he used to move ahead. He used to move around in tattered clothes and his hair and bread had grew too long. He was surviving only on rotis and all the while just focusing on Sadhna. At times he used to visit Guru’s satsang also. One day he expressed his desire to Paramhans Dayal Ji to be initiated into Sanyas. Shri Dayal Ji initiated him into Sanyas and he was named as Mahatma Swarupanand. At that time his age was twenty three. Mahatma Swarupanand Ji continued his bhajan and sadhna as instructed by his Guru. He used to remain in samadhi for many days. Shri Paramhans Dayal Ji used to keep track of his favourite disciple. Because of the blessings of his Guru, Mahatma Swarupanand Ji had become ready to take bigger spiritual responsibilities at a young age. During the lifetime of his Guru only, Swarupanand Ji had evolved himself to a stage where Paramhans Dayal Ji used to refer him as Paramhans Ji at times, to everyone else’s surprise. But this was not known to all. One day when Swarupanand Ji got up after completing his Sadhna he saw a Pathan rearing cows. When he asked for some milk from the Pathan, the Pathan replied that his cows where not yet able to give milk. Hearing this he gave a Lota to Pathan and asked him to take milk from a particular cow. When the Pathan tried, he became surprised that the Lota became full with milk. That particular cow kept on giving milk for many days. Shri Paramhans Dayal Ji possibly wanted Swarupanand Ji to attain even more spiritual height and for that some more sadhna was needed. So he was asked by Guru to visit Agra and continue his sadhna there. It was a difficult decision for him to be away from his beloved Guru, but he moved ahead as Guru’s instruction is supreme in Bhakti. He dug a cave beneath a Neem tree and started meditating and survived on whatever was offered to him. Whenever Paramhans Dayal Ji visited, he used to meet Swarupanand Ji in this cave only. Once Dayal Ji was visiting Jaipur. On hearing this Swarupanand Ji went there and met him. His Guru instructed him to go back to Agra again and continue his sadhna. Swarupanand Ji continued his sadhna for next many years and lost his health to a great extent. When Paramhans Dayal Ji heard about it he asked his other bhakt’s to get him back to Teri carefully. After some days of stay, when he regained his health, Paramhans Dayal Ji instructed him to conduct Satsang and Updesh. Now Guru has relinquished his responsibilities of uplifting mankind to his most worthy Shisya and had become relaxed. On request of bhakts from Lukky Mervad village, he was sent there by his Guru. When Swarupanand Ji was conducting satsang it started raining heavily one night. However people were surprised to realize next day that except the place near his bed, it has rained everywhere. It was an example of nature serving saints. In his last days, Paramhans Dayal Ji had already started addressing Swarupanand Ji as Paramhans. He had also indicated to his intimate followers that Swarupanand Ji had already reached the state attained by Ram,Krishna,Kabir and Nanak. Some days before his demise, Paramhans Dayal Ji asked Swarupanand Ji to stay with him. He also made him his official successor (Ruhani Janashin) thereby transfering all he had. Shri Swarupanand Ji was in a place Dera Ismail when Paramhans Dayal Ji breathed his last. He came back immediately to Teri, paid his respect to the samadhi and arranged for a grand Bhandara of his most loving Guru. 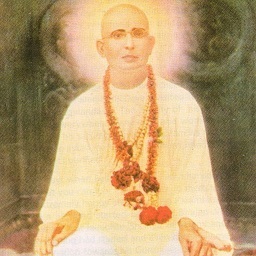 On 2nd October 1919 Shri Shri 1008 Swarupanand Ji Maharaj was offered Chadar Mahanti and was anointed as Gaddinashin Guru. Making Lukky Mervad as central location he started conducting Satsang and Gyan Updesh in places like Tal buland, Bannu, Tannk, Tailram, Kakkiyan, Bahadur Khel, Jatta, Lachi and Dera Ghazikhan. Thousands of followers got initiated into diksha in all these places and got blessed. An ashram was constructed in Lukky Mervad. All his subsequent ashrams were named as Krishna Dwara. He was always concerned towards the needs of his Bhakts. With his blessings, some of them were saved from impending accidents.